Problem: What diameter of pulley is needed if the desired speed is 500 rpm and the driven pulley is 6.0 cm and turns at 1725 rpm? 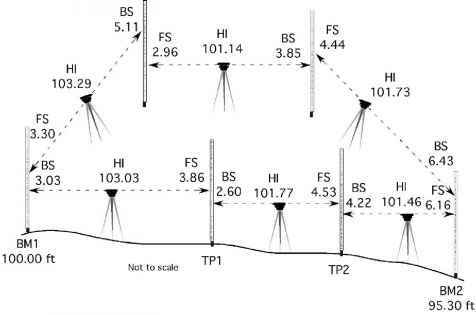 Problem: Determine the torque available at shafts A and B in Figure 6.14. Solution: The first step is to determine the speeds of shafts A and B. Shaft B is the first one in the series so it will be used first. Problem: How much force will be produced by the hydraulic system in Figure 6.15 when the diameter of the first cylinder is 5 cm, the diameter of the second cylinder is 15 cm and the force on the first cylinder is 50 kN? FIGURE 6.15. Force produced using SI units. Solution: Force divided by area equals pressure and pressure multiplied by area equals force. 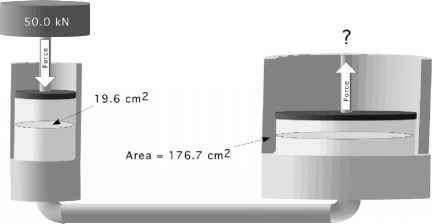 Problem: How far will the second piston, in the previous problem, move when the piston in the first cylinder moves 5 cm?